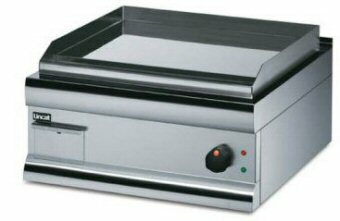 The flat-plate griddle is a mainstay of many breakfast and brunch-style catering businesses. Once hot, the plate does not require much power to maintain its temperature, which is one of the reasons that electric versions are more popular in the small-to-medium size ranges. Although more expensive, chrome plate griddles offer increased efficiency and reduced smoke and fumes. Our best-selling griddles are those in the Lincat Silverlink range of modular equipment, however Opus and Blue Seal are also popular in the larger size range. We offer generous discounts of 25% or more on all makes. PLEASE NOTE: to ensure we give the best possible service we limit our customer base to Kent, UK.